Have you ever dream of waking up in the morning, laying in a garden of peony flowers? The aroma of peony, much like an elegant fragrance, so light and fresh. Now, L'occitane fulfill our peony dream of skin perfection with its new skincare range - L'occitane Pivoine Sublime. The new species of peony (Paeonia Lactiflora) that grown in France is used in this range where it is formulated by the Perfecting Peony Complex through enzymatic hydrolysis (breaking down molecules into tiny fragments). minimize the appearance of pores and fine lines, while enhancing our skin complexion's radiance. Always start off our skincare routine with cleansing, using remover to remove all the impurities and dirt accumulated on face throughout the day. Do not even try to skip the cleansing part even though you are not wearing any make up or sunblock. It's indeed essential to double cleanse our face. The Perfecting Makeup Remover helps removing our day's makeup without stripping away our skin's moisture and keeping our face away from impurities particles. It comes in a clear gel texture, with a light refreshing floral scent. The gel texture doesn't form any foam after contact with water, without leaving the skin with any stickiness and oiliness, but with a hint of peony aroma. Here's a small test on the effectiveness of the remover on waterproof and non-waterproof makeup products. From the image above, we can clearly see that on the first wipe, my hand left with some eyeliner stain but barely remaining eyebrow pencil stain. After a few wipes, none of the remaining left on hand. 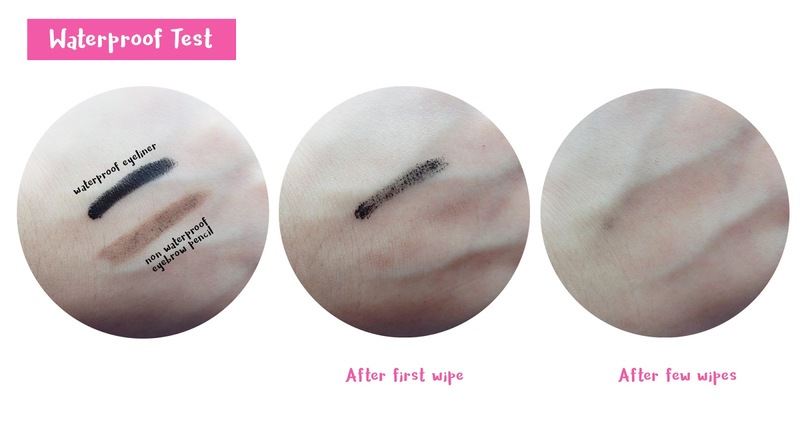 After the application of Perfecting Makeup Remover, my skin feel so much cleaner, moisture and softer, like baby skin! It effectively removes all the make up on my skin, while retaining the hydration in my skin. I totally love the formula of the remover as there's no inflammation or irritation feeling even during my bad skin day! I will definitely use it everyday on my entire face, eyes, lips and neck! Do remember to exfoliate our skin at least once a week. It helps removing the dead skin cells on the skin and boosting the absorption of further skincare regime like toner, cream and moisturizer. The 2-in-1 Perfecting Scrub consists of micro-granules that made up of the best micro-exfoliant active ingredients and peony extract that prep us for following skincare regime. By the way, it can be used as an exfoliation mask too. Apply a thick layer of scrub on face and leave it on for 5 to 10 minutes before rinsing it off! It comes in a clear pinkish gel texture with a blend of tiny beads that will slowly turn into oily texture. It turns into fine foam texture after contact with water. The lovely peony scent aside, I really love how gentle the scrub works on my face. I guess I may use it like twice a week? No harshness at all! After the application, it looks like there is a light protective film appears on my skin, keeping my skin smooth, soft and supple like a peeled-boiled-egg! Last but not least, tone up the face! The Perfecting Toner helps reducing the fine pores on our skin, making them less visible while reviving the skin radiance with a burst of hydration! Like the usual toner, the perfecting toner comes in a watery texture and of course, refreshing peony scent! Well, I have to say it again and again, the Pivoine Sublime range is all about Peony aroma! I am totally in love with this delicate scent and I will definitely use it everyday. Just to smell like a peony whenever and wherever I go. It's like putting on a peony fragrance that definitely helps boosting our mood! The Pivoine Sublime range just like a secret to flawless skin that definitely helps in restoring skin hydration and radiance glow! Benefit: Remove daily makeup and skin impurities while retaining the skin moisture level. Benefit: Can be used as both gentle scrub or intense exfoliation mask, leaving the skin soft with suppleness. Benefit: Refreshing toner that helps minimize pores and revive skin complexion. *All the products available in L'occitane outlet and counter. I bet the smell is stunning just like you. I always love loccitane. Oh, may I know what waterproof eyeliner you use? I have been trying to get a good one but so far I have not fine anything that doesn't smudge. I wish to try the 2-in-1 Perfecting Scrub, heard that its good. I like the packaging.. I'm sure the product is as good as the packaging.. I am a big fan of Pivoine Sublime range. So pretty in packaging and smell so nice! Have not own any L'occitane product before but this range is really attractive, both visually and from your review. I think I am already sold. love the colour. looks moisturizing and pampering! will check them out! The bottle looks unique. I want to try out the L'occitane Perfecting Makeup Remover. The Loccitane products look quite classy. Results on your face also look promising. Love their packaging and that bright red is making it feel so rosy.